Whether you are a designer, a fashionista, or simply a homeowner with an eye for design, you have probably walked into a room in a hotel or perhaps a neighbor’s house and thought – how out-dated! Fashion can be a capricious mistress, even in the world of interior design. The hottest designs can be “très” chic one day and passè the next. While it may be easy to donate last year’s leggings to the local thrift store and run for the nearest Nordstrom’s, designing your living space is a long-term fashion choice; so, it is imperative to be able to tell the difference between a passing fad and a lasting trend. Good design is lasting design. Consider the works of legendary designers, Nancy Lancaster and John Fowler their interiors reflected a style both casual and elegant. They achieved this look by combining classic furnishings from different styles, French, English and continental and putting them together in a new way to create something fresh and unique. They often incorporated Asian porcelains, Chinoiserie screens, and other unusual decorative accessories that set them apart from their competition. Their unusual combination of classic styles has been imitated for decades. Why? They were able to capture the classic elegance of antique furnishings and use them in a new way to create a fashion-forward trend. The latest craze may capture the spirit of the moment, but take time to consider whether it is worthy enough to become a classic or lasting endeavor. Use caution when you see a color, technique, or stylized design used too often, it may be a passing fad that will leave your home looking dated. 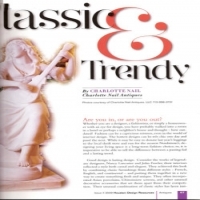 The classics, com¬bined with ingenuity will span continents and have universal appeal. Modern is a relative term. New things can be old-fashioned, but old things can be updated and considered cutting edge. Fresh ideas, combined with the classics, can create an eclectic combi¬nation that can be very exciting. You may ask why some styles never lose their appeal. The answer is quite simple: the best designs combine good form and function, and arc made from quality materials. For centuries, artists and wood-workers have followed this rule to perfect the masterpieces we now call antiques. Antiques excellent solution to the quandary of avoiding passing fads; they have a lasting quality that cannot be duplicated. As the world’s best hard woods and wood-working craftsmen become scarce, it has become more and more difficult to reproduce the quality and unique nature of antique furniture. When the last fad has down the coop, the designs of the 18th and 19th century will still be attracting new flocks of devotees. Furniture that has great form and function stands up to the test of time to become classic fixtures in our homes. The Bombe’ chest is a good example of a classic; it has simple lines and beautiful curves, while providing ample space for storage. It has proven itself because of its form and function, and thus has been replicated since the 18th century. The Wing Chair is another great example – in tall back and arms kept away the drafts of old homes, while tying rooms together with colorful fabrics. Thomas Chippendale was a visionary, and his designs are still being copied today. Once you’ve identified your classic pieces, bring them up-to¬-date by pairing them with tasteful contemporary trends. Play with faux finishes, clean lines, painted furniture, animal prints, colorful walls, or a new trend of your own design. While each of these can be over-powering on their own, they can provide a touch of excitement when combined with the classics. Trends capture a unique mind set – a curiosity to look at things anew and appreciate both the old and new in a different light. Combine elegant antiques with the trends of the day to find your own signature style that defies the test of time. It is left to you, the designer, to arrange and combine the classics in a new way to create exciting interiors. Antique are great resources for the trade, as they are unique and well made, and they are the ultimate “green” product. Let the classics help you start your very own trend.